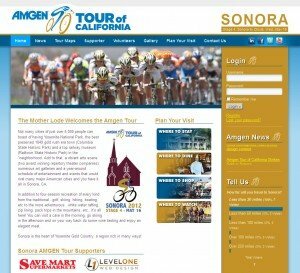 Today, we rolled out the launch of the website for AMGEN Tour of California: Stage 4, Sonora, CA stop. Level One Web Design has been working with directly with professionals such as Larry Cope, the Director of Economic Development, for Tuolumne County Economic Development Authority and Darrell Slocum, the Social Media Director Golden State Cellular, who is heading up the Media/PR team for the event. This is the first year that the AMGEN Tour of California will be making Sonora, CA one of it’s stages in the race. It is expected that the hosting Stage 4 of the race will bring in approximately 20,000 people to the greater Sonora, CA area. The Amgen Tour of California is one of the nation’s largest and most recognized annual sporting events and is America’s most successful cycling race. The Amgen Tour is an eight-day event featuring eight stages across California. This prestigious cycling road race features elite professional teams and athletes from around the world. The Amgen Tour of California brings the drama and excitement of professional cycling to California for the seventh consecutive year in 2012. The Amgen Tour of California awards important, world-ranking points to the top finishers. Level One Web Design is proud to participate in this historic event for Sonora. We are honored to have been chosen to design and develop the online face of this momentous event. We’ll be continuing to add additional information to the Amgen Tour of California – Sonora site as it becomes available, so stay tuned.